Acoustic Noise Cancellation reduces unwanted noise to provide clearer sound from the headset. You can adjust noise cancellation based on your listening preferences and environment. HIGH: Set the switch to "HIGH" for maximum quiet and noise cancellation across the entire spectrum. Best signal to noise ratio for radio and intercom communications. MED: Optimised mode for quieter aircraft. LOW: Best for interpersonal communication. Note: By default, Tap Control is disabled. To enable Tap Control, see Setting the control module operation switches. When you need to focus on communication in the aircraft that is not coming through the intercom or via a BLUETOOTH connection, you can automatically set noise cancelling to Low for a single earbud by double tapping that earbud. Double tap the earbud again to set noise cancelling in both earbuds to the Acoustic Noise Cancelling switch level—or move the control module switch to another position. Tap Control is not a touch control feature. You must firmly double tap the earbud in order to activate the feature. 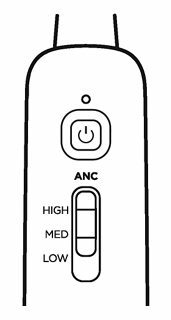 Because Tap Control changes the selected earbud's noise cancellation level to Low, Tap Control only works when the ANC switch on the control module is set to High or Medium. If the switch is already set to Low, Tap Control has no effect.